Politkovskaya, 48, a journalist renowned for her critical coverage of the Chechen conflict, was found slain in her apartment building in Moscow, according to international news reports. The Interfax news agency, citing police, said Politkovskaya had been shot and that a pistol and four bullet casings had been found. Igor Korolkov, a colleague, told the Regnum news website that Politkovskaya had been reporting on alleged torture in Chechnya. Politkovskaya was poisoned on her way to cover the Beslan crisis. After drinking tea on a flight to the region, she became seriously ill and was hospitalized–but the toxin was never identified because the medical staff was instructed to destroy her blood tests. Politkovskaya had been threatened and attacked numerous times in retaliation for her work. In February 2001, CPJ research shows, security agents detained her in the Vedeno district in Chechnya, accusing her of entering Chechnya without accreditation. She was kept in a pit for three days without food or water, while a military officer threatened to shoot her. Seven months later, she received death threats from a military officer accused of crimes against civilians. She was forced to flee to Vienna after the officer sent an e-mail to Novaya Gazetapromising that he would seek revenge. When Politkovskaya covertly visited Chechnya in 2002 to investigate new allegations of human rights abuses, CPJ research shows, security officers arrested her, kept her overnight at a military base, and threatened her. In October of that year, Politkovskaya served as a mediator between armed Chechen fighters and Russian forces during a hostage standoff in a central Moscow theater. Two days into the crisis, with the Kremlin restricting media coverage, Russian forces gassed the theater and 129 hostages died. Politkovskaya delivered some of the most compelling accounts of the tragedy. In 2009, a Moscow jury acquitted three suspected conspirators, the brothers Ibragim and Dzhabrail Makhmudov and former Moscow police officer Sergei Khadzhikurbanov. Another Makhmudov brother, Rustam, whom authorities identified as the gunman, was at large at the time. Investigators acknowledged they had rushed a poorly prepared case to trial. An appellate court later granted a re-trial. The case moved forward again in 2012, when prosecutors indicted Dmitry Pavlyuchenkov, a retired police lieutenant colonel, on charges that he helped orchestrate the murder. Authorities accused Pavlyuchenkov, head of surveillance for Moscow’s main police force in 2006, of ordering subordinates to follow Politkovskaya and determine her schedule and usual travel routes. The information was then passed along to the gang hired to kill the journalist, prosecutors said. In December 2012, Pavlyuchenkov was sentenced to 11 years in prison on charges that he was an accomplice in the plot. Family and colleagues were dismayed by the ruling, which came after a closed proceeding; lawyers for Politkovskaya’s family said they would appeal. Colleagues and relatives had hoped Pavlyuchenkov would identify the masterminds in open court. Following the verdict, investigators said they considered exiled tycoon Boris Berezovsky and Chechen envoy Akhmed Zakayev to be the masterminds–an assertion dismissed by Politkovskaya’s representatives as unfounded and politically motivated. Five other suspects were in detention in late 2012, including all three Makhmudov brothers, former officer Khadzhikurbanov, and Chechen underground leader Lom-Ali Gaitukayev. Prosecutors said Gaitukayev served as the main organizer and liaison between the masterminds and Pavlyuchenkov. 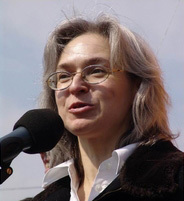 On May 20, 2014, a Moscow City Court jury found the five defendants guilty of planning, participating, and carrying out Politkovskaya’s murder, local and international press reported. On July 9, 2014, the court sentenced Rustam Makhmudov, the convicted gunman, and Gaitukayev, the organizer of the crime, to life terms in prison. Two other Makhmudov brothers, Dzhabrail and Ibragim, convicted as the gunman’s driver and lookout, received 14- and 12-year jail terms, respectively. Convicted as an accomplice to the murder, Khadzhikurbanov received 20 years in prison. No one was tried as the suspected mastermind. Anna Stavitskaya, lawyer for Politkovskaya’s adult children, told CPJ, “My clients, Ilya and Vera Politkovsky, are convinced that the men sentenced indeed bear responsibility in the murder. But they are also convinced that the crime is far from being fully solved.” Frustrated with the course of the investigation, the journalist’s family applied to the European Court of Human Rights, which could intervene if it concluded local authorities did not carry out a proper inquiry. On June 24, 2014, the Moscow City Court said it would hear Pavlyuchenkov’s appeal to postpone the start of his prison term because of alleged health problems, including mental health issues. (Pavlyuchenkov was being held in a detention facility pending appeals.) A court scheduled a hearing for his case on August 18, 2014. Politkovskaya’s former colleagues at Novaya Gazeta said Pavlyuchenkov knew much more about the murder than he had revealed. They said the investigating authorities were aware of this but had not pressed him to speak. They said the official investigation was lacking in other ways as well: They said it had become clear a number of officers with the police’s elite secret department and the Federal Security Service (FSB) played roles in the murder, but none of the officers were brought to justice.